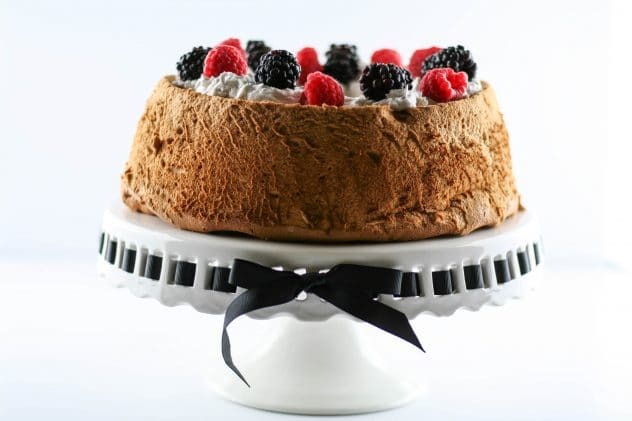 When I think of Easter desserts for some reason angel food cake with fresh fruit comes to mind. I know, I know, for some of you it might be chocolate covered peanut butter eggs, but remember, I’m a nut-free kind of gal. When thinking about how to adjust traditional angel food cake recipes (or even worse, the store-bought box version) for a healthier, Paleo friendly recipe, I immediately took to the internet. I’m not quite bake-savvy yet to just whip up cake recipes from memory or scratch. I came across this awesome grain-free and nut-free version from Deliciously Organic. Kudos to Carrie Vitt on creating this delicious Paleo friendly recipe! This might just be the dessert I bring for Easter dinner this weekend. I mean, it’s not some crazy, healthy recipe everyone will turn up their nose to. It actually tastes JUST LIKE regular angel food cake. 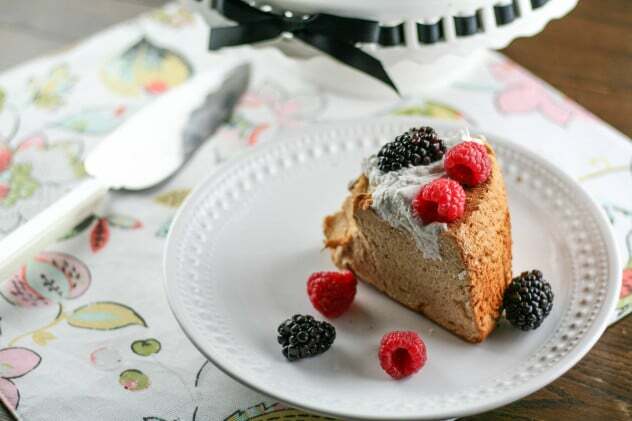 This recipe calls for coconut sugar so the coloring of the cake is a bit darker than regular angel food cake, but still spongy and delicious none the less. It did require me to have to borrow an angel food cake pan from my mom. I’m slowly stocking up my kitchen with the necessary items I need but did not have this type of cake pan just yet. Thanks to my mom, she had an extra and (I think) I get to keep this one!! Score! One extra note about angel food cake pans if you’ve never used one. Many of the newer cake pans have little legs on them because you have to cool the angel food cake upside down. If your angel food cake pan does not have legs to keep it up off the ground, you can turn it over and rest it on top of a small canned good. 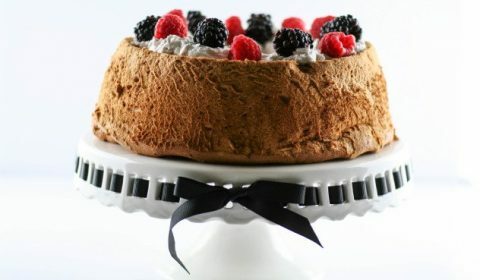 Do me one favor though…don’t ruin this beautiful grain-free, nut-free angel food cake by piling on cool whip (can you say toxic?! Skip the high fructose corn syrup, PLEASE!) or douse your fruit in sugar. You can whip up a fresh, homemade coconut cream to use and use organic berries, no extra sugar or chemicals needed! I could have literally ate this homemade cream by the spoonful! Impress your family by bringing in this homemade dessert that you can brag about making yourself AND it’s much healthier than any store-bought version. Preheat oven to 350 degrees (Fahrenheit). Make sure your oven rack is in the middle position so the cake pan fits. Add egg whites and lemon juice in medium sized bowl. Beat the egg mixture on medium-high speed until foamy. Add in the salt, cream of tartar, and vanilla and beat again on medium until soft peaks form. If you are using a hand mixer, this part can be tricky, but you’ll want to keep the mixer on medium-high and slowly add in the coconut sugar, about one tablespoon at a time. Continue until all sugar has been mixed in. Sift the remaining 1/4 cup coconut sugar and arrowroot flour into a small bowl. With your mixer on medium, slowly add in the arrowroot flour mixture, then turn up the speed to medium-high and mix until smooth. Pour your batter into the angel food cake pan, no oil needed. Bake for 40-45 minutes or until the top is golden brown. Remove cake pan from oven and carefully turn the cake pan upside down. (Remember my note above, if your cake pan does not have legs you’ll want to rest to cake on top of a canned good.) Let cool for at least 1 hour. To remove the cake from the pan, run a knife around the outside and inside edges and invert onto a cake platter. 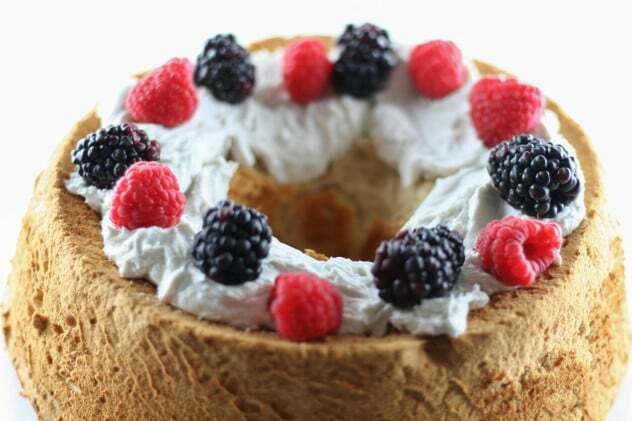 Top with homemade cream and berries of your choice.